Derry City boss, Declan Devine has made an encouraging start to the 2019 season. DUNDALK first team coach, Ruaidhri Higgins has hailed the galvanising effect Declan Devine has had on Derry City since beginning his second spell in charge. 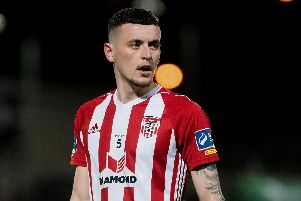 The former Candy Stripes midfielder has been hugely impressed with the change in mood on Foyleside and wasn’t surprised to watch Devine’s young team run champions, Dundalk close at the Ryan McBride Brandywell Stadium on Friday night. Higgins, who won the FAI Cup twice and five EA Sports Cups during two spells with Derry City as a player, says he was delighted to see the Derry support coming out in their numbers to get behind a ‘young, hungry’ team. And the Limavady native, who was linked with the Derry managerial post following Kenny Shiels’ sacking, claims there’s a new vibrancy about the playing staff and fans and predicts a successful season under the guidance of Devine and his all-Derry backroom team. “It’s obvious for everyone to see that the management team has galvanised the players and the crowd,” said Higgins. “They’re coming in their numbers to the Brandywell which is brilliant to see. This is a massive football club and its great to see them coming through the gate. The players and management deserve that. “Obviously I wanted us to win but I have a soft spot for Derry. I think there’s more passion, more energy, more vibrancy and Declan has gone with young, hungry players who have gone under the radar with other clubs. I think they’ve recruited really well and I wish them all the best. I’m delighted to see it go well for them so far. Higgins hung up his boots in January 2017 to take up a role as Dundalk’s opposition analyst and coach but this season he’s taken on a bigger role on the training ground as first team coach. And he’s relishing the chance to learn the coaching ropes under Lilywhites boss, Vinny Perth and his assistant, John Gill. “I would’ve been heavily enough involved in previous years but it’s a more day to day basis now with players on the pitch and Vinny and John. It’s great to learn off them as well and Stephen O’Donnell has joined the backroom staff as well. On Friday night Dundalk ended Derry’s perfect opening to the season at the Brandywell venue with a 2-0 victory. The champions shaded possession and were simply more clinical in front of goal as Sean Murray and a Pat Hoban penalty proved decisive. Both sides had their chances in either half as both Peter Cherrie and Gary Rogers produced sensational saves but Higgins felt Dundalk deserved the win after a professional display. “I thought chances were even enough first half. Derry missed a great chance, the one under the crossbar and it just went over. Peter Cherrie pulled off an amazing save from Pat Hoban but I thought it was a really even first half. “Our overall performance was really professional. We got the goal at a good time and seen it out and I felt we really got control of the game in the second half. It was a clear cut penalty too. Pat was brave and got his head in there before Peter clatters into him and unfortunate for Peter he got injured. “We needed three points and that’s now three clean sheets in a row for us so we’re happy with that. “We’ve four seasoned professionals missing for the last three or four weeks, boys who have won everything in this country.